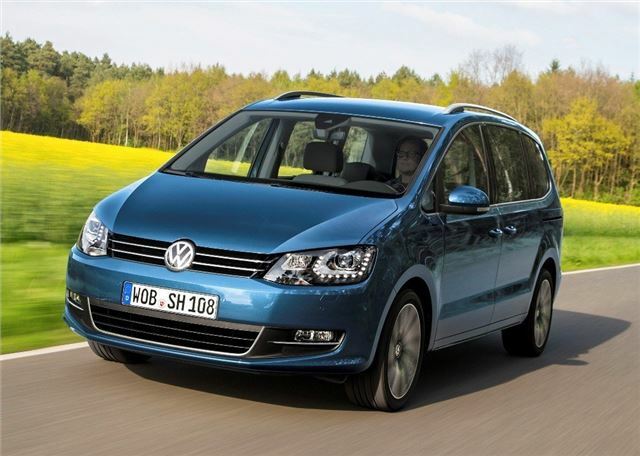 Over the past 20 years the Volkswagen Sharan has established itself as the sensible choice of MPV for the grown-up and sensible family driver. 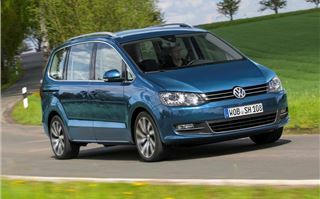 However, with BMW, Citroen and Ford snapping at its heels, Volkswagen has decided to give the old Sharan a much needed mid-life update. From the exterior, you’d struggle to tell the 'new' Sharan apart from its predecessor. In fact, from the front, it's almost impossible to tell the two models apart. However, Volkswagen assures us the exterior has been tweaked, with new bumpers and lights, although the only notable difference is found at the back with new rear light clusters which now feature LEDs. The real changes to the Sharan are to be found under the bonnet: all of the diesels have been revised and brought up to Euro 6 standard, which means they are more powerful, more economical and emit less CO2. As a result the 2.0-litre TDI - the biggest seller in the UK - gets a 10PS power hike to 150PS, while emissions drop to 130g/km of CO2. Fuel economy is better too, with Volkswagen claiming up to 56.6mpg. 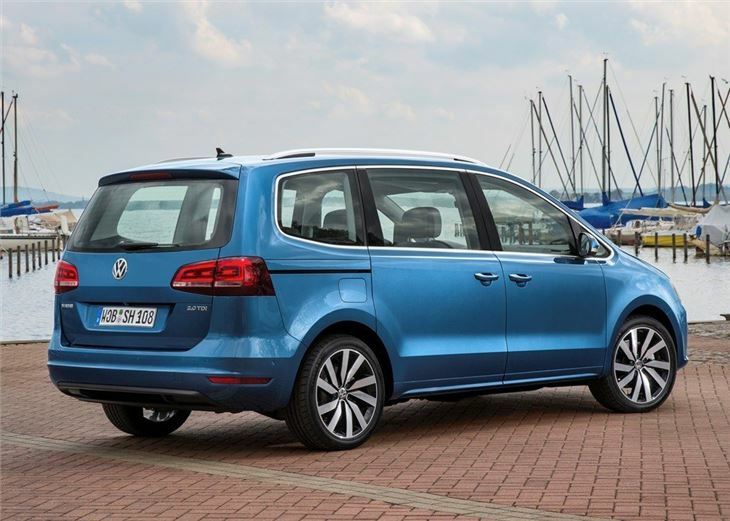 The Sharan also gets more equipment as standard, with touchscreen infotainment, three-zone climate control Bluetooth and automatic post-collision braking included at no extra cost. Like its predecessor, the Easyfold seating system and two sliding doors are standard, while powered doors are available for an additional £620. 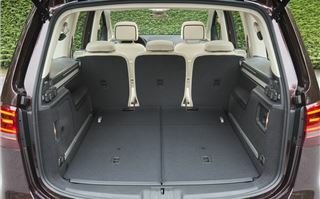 The biggest selling point of the Sharan lies in its versatility. 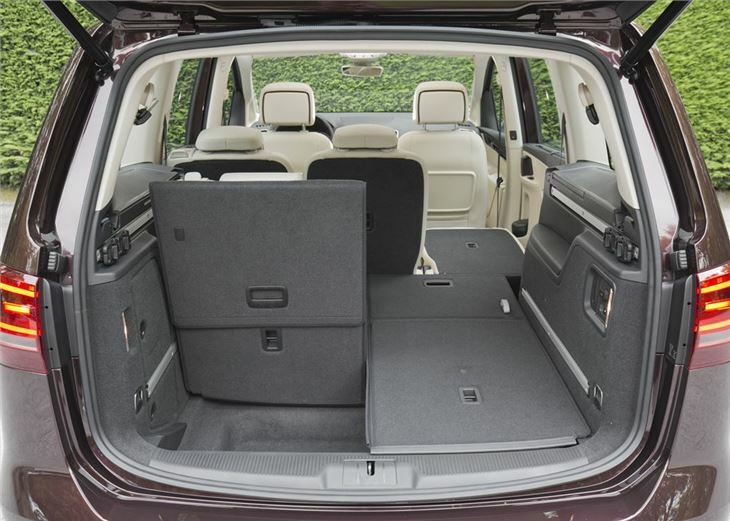 With three rows of seats, lots of cabin storage and ISOFIX tethers for all five rear seats. 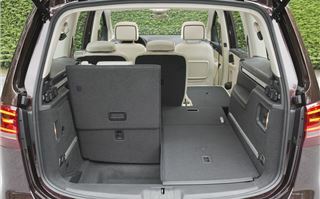 As a result, the Volkswagen is great for families, with easy access to both rows via the twin doors and an abundance of hardwearing plastics that should endure life with young children. 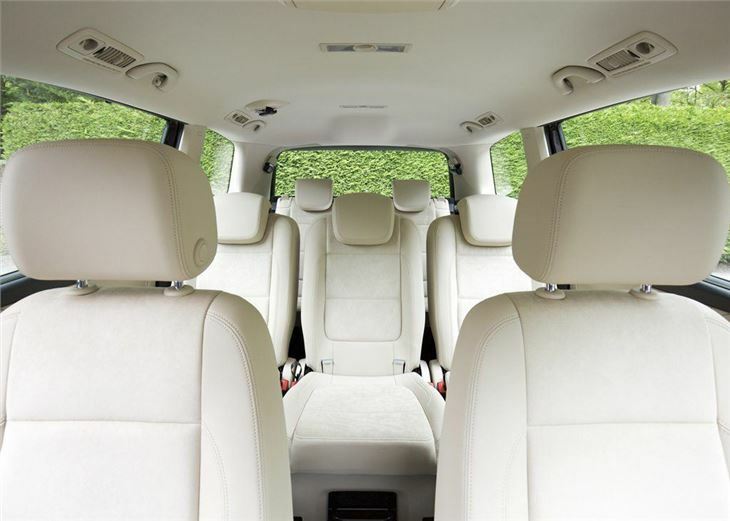 The interior is large and spacious with room for three Isofix child seats across the second row and enough head and leg room for up to seven adults. 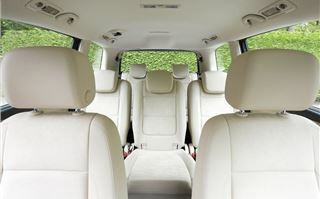 The Sharan is extremely comfortable on long trips with plenty of back and upper leg support in the seats. What's more, the middle row slides forwards, which means getting to the third row is easy enough, although six-footers will find head room limited, due to the nature of the sloping roof. 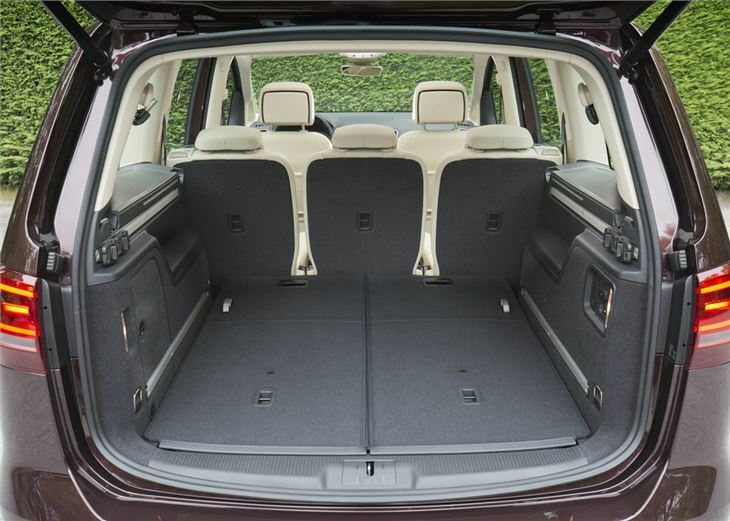 With all of the seats raised, the Sharan returns a modest 300 litres of boot space, but this can be increased to a cavernous 2297 litres by flattening the second and third rows. Moving the seats around is easy enough, thanks to a lever built into each seat. You simply push and fold to get a completely flat floor. Up front the driver gets an intelligent and classy dashboard, with simple controls for the heating, air con and blowers. The five-inch touchscreen infotainment system has a bright and clear display with just simple hand movements required to access the in-car media, DAB and settings. Apply CarPlay, Google Android Auto and MirrorLink can also be added for £100, which lets the driver access phone apps (such as navigation or music) via the infotainment screen. 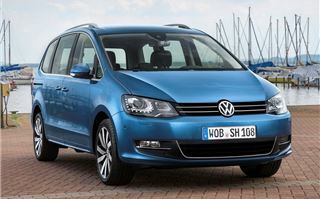 On the road the Sharan is refined and comfortable, with a soft and quiet ride that makes the MPV a pleasant motorway cruiser. However, the drive is more functional than fun, with limited feedback through the steering wheel and pedals. 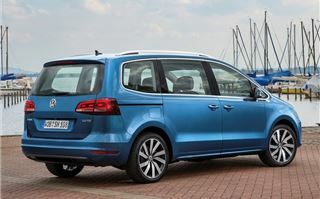 The Sharan also rolls heavily in the comers, while there's no hiding the car's large dimensions, which means it can be difficult to swing into tight parking spaces. The 2.0-litre diesel engine is responsive and refined, with 340Nm of torque from 1750rpm, which means the you're never short of low-gear pull. The Sharan can be fitted with either a six-speed manual or DSG automatic gearbox, with both working well to distribute power evenly across the ratios. When it comes to recommending the Sharan, the only real sticking point is the price. It isn't cheap by any stretch of the imagination, with the range starting at £26,300. The SE model (tested here), which includes roof rails, parking sensors and tinted glass, pushes the price beyond the £30,000 barrier. In comparison, the new Ford S-MAX is cheaper (£24,545) while the Citroen C4 Grand Picasso undercuts both with entry-level models starting at less than £20,000. Even the BMW 2 Series Gran Tourer is less to buy. And, if truth be told, all three are more fun to drive. 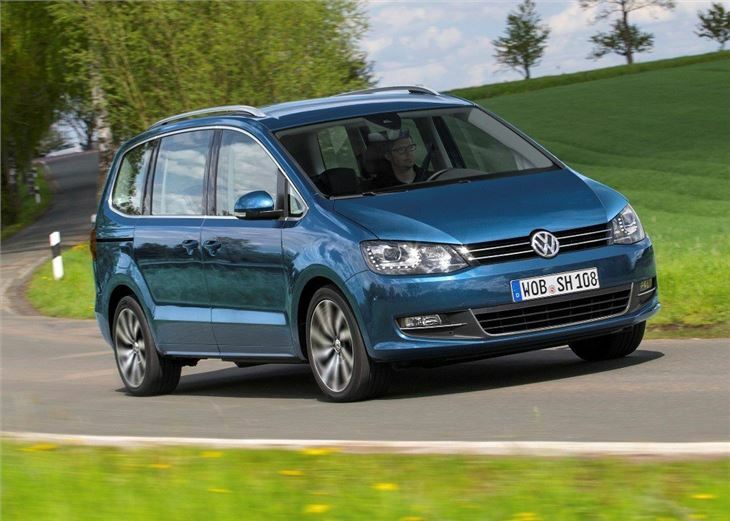 However, if you are the type of person who frowns at frolics in an MPV and wants a sensible, grown-up car that has bags of practicality and refinement, the Sharan will probably be the family car for you. Just don't expect any fireworks behind the wheel. 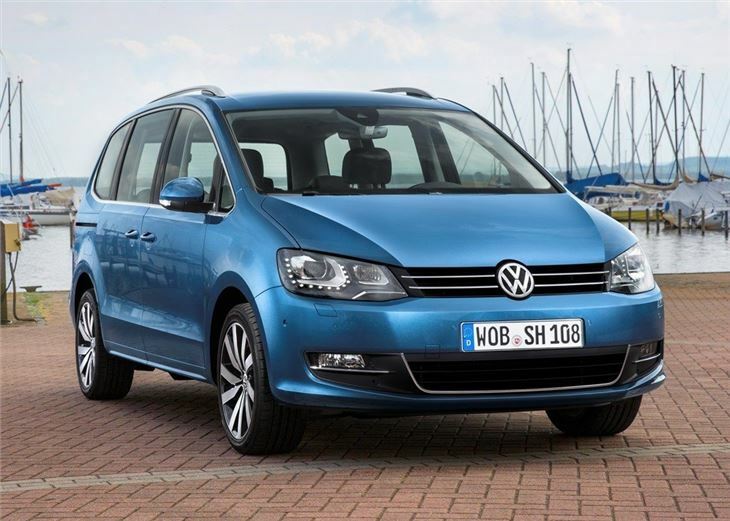 The new Volkswagen Sharan is available to order now with the first cars arriving in October.